Install ArtRage, find your serial, and get orientated with the Getting Started page! The ArtRage 5 Quick Start Guide is a good orientation to the new features. It’s also included in your software, under Help > ArtRage Manual. 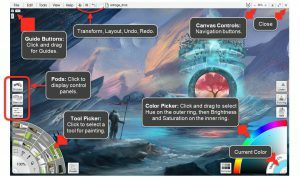 ArtRage Lite also includes a Quick Start Guide, as well as this online introduction to the tools and interface. If you are looking for drawing and painting tutorials, see the Art Tutorials and the How To Draw guides. If you need more advanced advice, read the online manuals for individual features. Browse down the links on the right, or follow the links below. New features in ArtRage 5 are covered by guides in the ArtRage 5 category, and linked on the right. Features carried over from ArtRage 4 are covered by the ArtRage 4 manual. ArtRage 2, ArtRage Studio 3, ArtRage Studio Pro 3, and ArtRage 4 have been discontinued. The latest edition is ArtRage 5. Users with ArtRage 2, 3 and 4 can upgrade to ArtRage 5 at a discount. The ArtRage 4 manual is still online as we have many users who are still using this edition and because it also applies to ArtRage Lite (which has the same features, just not as many of them). Almost all the features in ArtRage 4 still exist in ArtRage 5, so a new ArtRage 5 manual for these features would simply duplicate the same content (although we will update them over time). You can find an ArtRage 4 manuals index here or browse the entire category of posts. Find downloadable content for the desktop editions (e.g. brushes, older manuals, and color samples) in the Resources category. The tools inside the Android and iOS apps are the same tools and features found in the desktop program, so we haven’t duplicated these features in depth in the manuals. The online guides mainly cover the interface and specific mobile features (such as shortcuts and exporting). Note: The mobile apps do not need a serial. If you see a reference to a serial number, you are reading instructions for the desktop editions. You cannot install the desktop software on your iPad or Android tablet. iPad users can find a quick start guide by going to main menu > Help Files. You can find more advanced feature guides here. Android users can find a manual inside the app by going to main menu > Help. Some of these pages are also online here.